To me personally, it is becoming comical how many of my reviews are based on products that I've been picking up at daily snack time at my office. But hey, I'm saving a couple bucks by not having to actually purchase these at the store, so in the end, it's a good thing for me. 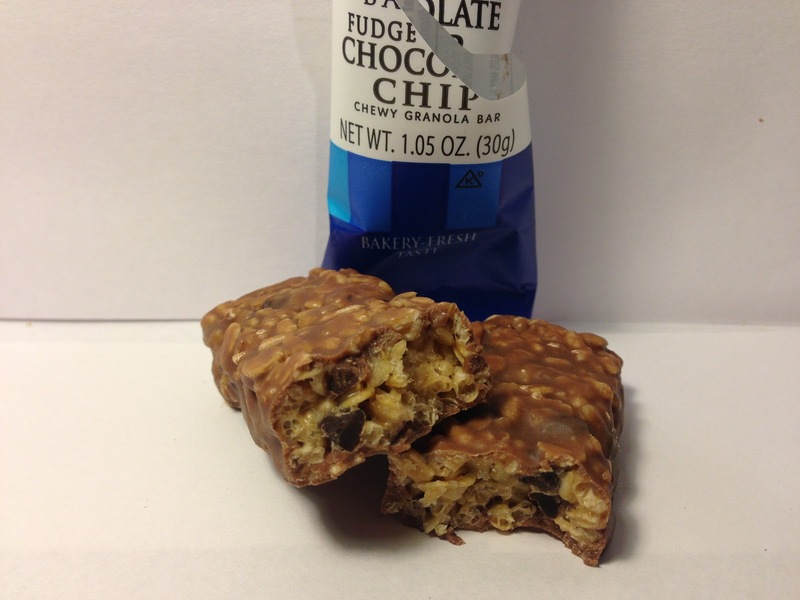 It's at a recent snack time that I picked up this Sunbelt Bakery Fudge Dipped Chocolate Chip Chewy Granola Bar. It comes in at 1.05 ounces and has 150 calories. It also proclaims that it has a "Bakery Fresh Taste" on the wrapper, but we'll let the Crazy Food Dude be the test of that one! I think the product name pretty much says it all here. It's a granola bar with chocolate chips that dipped in chocolate. Basically, it's the same thing as a Quaker Chewy Dipps bar with a some exceptions. The first exception is that this bar, while dipped in chocolate, is not entombed in a absurdly thick layer of chocolate like the Dipps products are. In the case of this bar, it's merely an outer coating is fairly thin. 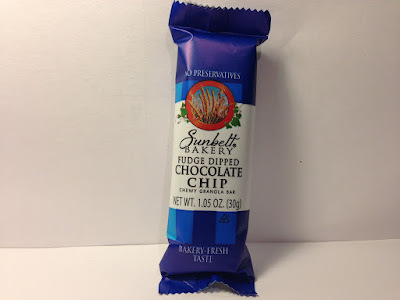 Because of that, you can see more of the granola bar inside and that brings me to the second difference, which is that the granola in this Sunbelt Bakery product is made up of larger pieces and at least has the appearance of being less manufactured since it looks like it is just thrown together as opposed to something that is perfectly manufactured like the Dipps products. As for the rest of the bar, it's pretty much what you'd expect...chocolate chips in the middle, sweet smelling chocolate, etc. In terms of the taste, it's pretty much as you'd expect too. The granola is crunchy, yet also soft, so that means that it more than ably meets the chewy part of its name. The chocolate is sweet, yet not at all overpowering and the fact that the outer layer of chocolate fudge is thinner than a Dipps bar is actually a welcome change. In the case of this bar, the granola is more of the star of the bar as opposed to the chocolate and I would think that is they way it should be since this is truly a granola bar after all. The chips in the granola melt in your mouth, which is nice and also have a sweet flavor. All in all, this bar performs as you'd expect and meeting expectations is never bad. Buy It or Fly By It? BUY IT. Nothing about this bar is going to knock your socks off, but it delivers on everything it promises in a tasty way and that's all that I can really ask for in a product that has such a basic premise based on granola and chocolate. I can't say that it tasted bakery fresh like the packaging implied (heaven only knows what that is supposed to mean), but it did have a fine taste and if this is one of your options in the store, don't hesitate to grab it off the shelf and throw it into your cart. I used to eat these all the time as a child. They are definitely more like candy bars than anything else... but still tasty. Me too. I loved these as a child, but I'm afraid they have recently changed them. They are no longer as much like a candy bar as they use to be. Now they are much smaller and dryer. More like a Quaker Dipps. They have coconut. I definitely taste it. Tastes similar to the "Samoa" Girl Scout cookies but with granola instead. It was very soft to chew, which I like because I don't like the hard granola bars.